28th August 2018, New Delhi: In a big win for the consumers, Bureau of Indian Standards last week said that it will set up new standards to measure quality of services offered to consumers across different sectors, including telecom, aviation, e-commerce, healthcare, banking, construction, after sales services etc. 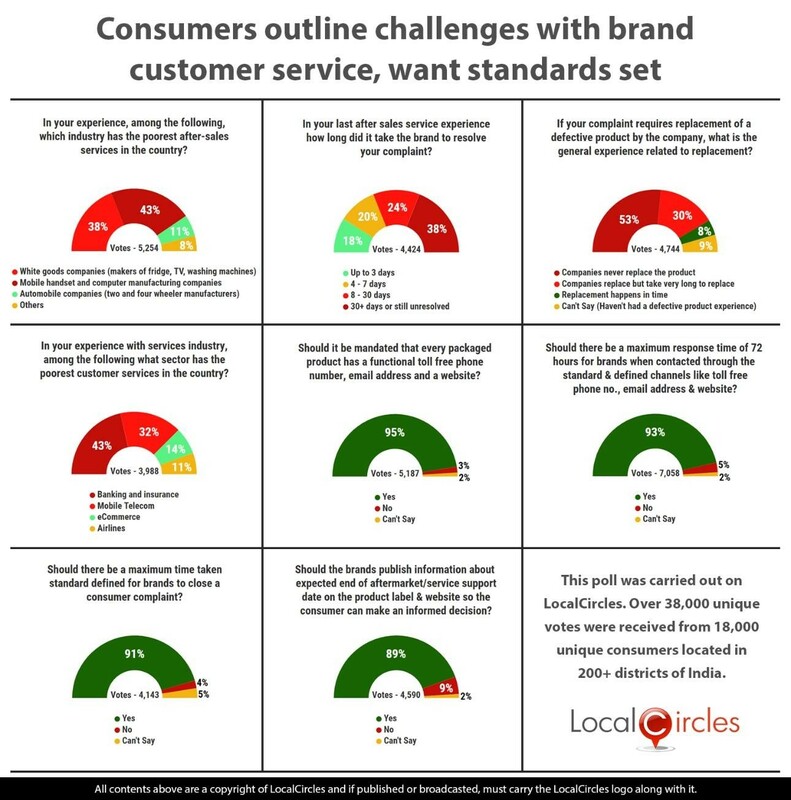 The decision came weeks after LocalCircles shared its survey on “Consumers demanding standards for services” with Department of Consumer Affairs and BIS. Many cases of ineffective services have been reported by consumers on LocalCircles in the last 18 months. To get data points, LocalCircles thereafter conducted a set of on the issue. With more than 38,000 votes coming in, the result of the poll showed that majority of the consumers are on the same page when it comes to the effectiveness of services in the country. The first question asked consumers in their last after-sales service experience how long it took the brand to resolve their complaint. 18% said it took up to 3 days, 20% said it took 4 - 7 days, 24% said it took 8 - 30 days and 38% said it took 30+ days or is still unresolved. The second question asked consumers which industry has the poorest after-sales services in the country in their experience. 38% said white goods companies (makers of fridge, TV, washing machines etc. ), 43% said mobile handset and computer manufacturing companies while 11% said Automobile companies (two and four-wheeler manufacturers). 8% chose others. In the fifth poll, 93% consumers said that brands should acknowledge complaints within 72 hours when contacted through the standard modes of a toll-free number, email or website. 5% of consumers voted against it and 2% chose not to answer the question. The sixth poll asked consumers if it should be made mandatory for every packaged consumer product to have a functional toll-free phone number, email address and a website in the interest of good customer service. 95% of consumers responded in a ’yes’ and only 3% responded in a ’no’. 2% were unsure about it. BIS which organized an interactive session with industry last week said that it will focus on 12 champion sectors to start with and develop standards for services. Both public consultation and industry consultations will take place to ensure standards made are exhaustive and can be implemented, said BIS. BIS will have a separate Division Council on Services which will have separate sectional committees in all the 12 identified champion sectors.